Each year we hope more and more people change the way they make their clothing (and jewelry) purchase choices. More and more people are speaking about the Fashion Revolution. Do you know why this movement started? In April 2013, the largest garment factory disaster in history took 1134 lives and injured thousands. Does this ring a bell? 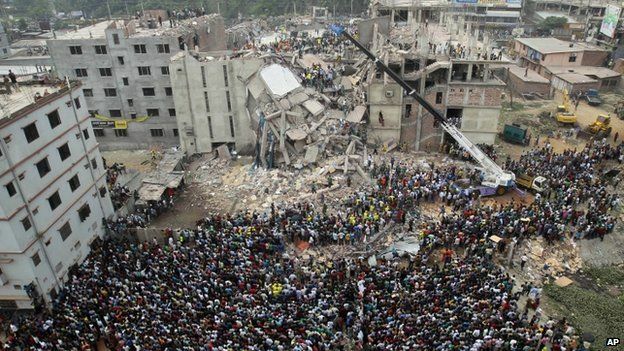 It happened at Rana Plaza in Bangladesh. This is the incident that played out across all media in the biggest way. The photos were absolutely horrifying. It was the pinnacle of garment factory disasters that made many consumers ask "Who Made My Clothes"? The horrors of Rana Plaza do not represent a stand alone event. Tragedies on various scales have taken place for decades. Why do you think garment factories have always been called "sweat shops"? There has always been abuse with clothing factories. At the turn of the century disasters also took place within our borders. 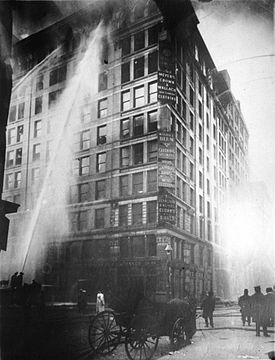 The Triangle Shirtwaist Factory fire of 1911 in New York City took 146 lives because the doors were locked and the workers could not flee. (Shop owners at the time suggested they wanted to reduce worker breaks and opportunities for possible theft.) It's only because the cost of labor has increased so much in the USA that so many manufacturers have taken their projects overseas. And because a majority of consumer want to buy as much as they can as cheaply as they can - many manufacturers and importers in their efforts to fill this demand continue to 'brow beat' third world producers into providing cost so low, they cannot offer fair wages or safe conditions for their labor force. The "Fashion Revolution" encourages consumers to ask "Who Made My Clothes?" The question essentially demands transparency in manufacturing. This is a concept Dunitz & Company has been practicing through our commitment to fair trade for more than 25 years. At Dunitz & Company we'd like consumers to add the question specific to us - "Who Made My Jewelry?" [Yes, I know who made my jewelry.] We believe in a world where everyone is treated with dignity and respect and our planet's environment is protected. If more and more people begin asking the question "Who Made My...fill in the blank?" and genuinely cared about the answer, our world and the people in it would be much better off. April 24-30 has been defined as this year's 'Fashion Revolution' week. Were you planning to shop at H&M or Forever 21? Perhaps think twice about shopping chains known for churning out the cheapest fashion at the expense of worker well being. Write a letter to their CEOs and demand information about "who made the clothing" they sell. If enough people ask the questions and purchase from companies that provide adequate answers then many manufacturers might alter their business practices. Small changes at big manufacturers can make huge differences. Looking for socially responsible companies to purchase from? It's easy to research suppliers online. Dunitz & Company is a member of Fair Trade Federation. You can easily review FTF's member lists and find ethical suppliers that retail clothing, jewelry and gifts. The Good Trade, a reputable blog recently published a list of clothing companies with honorable business practices. (We're waiting for them to blog about fair trade jewelry and hope they mention us!) There are lots of reputable bloggers that explore the ethics and sustainability of fashion. One we like a lot is Style Wise. Green Forward - Did You See Melania This Week?